In 1973 a United States Navy DC plane ran out of fuel and crashed on the black beaches of Solheimasandur along the south coast of Iceland. Thankfully, everyone in the plane survived. The walk really isn't too bad if you've got company, but be prepared to be tired on the walk back. The path isn't exactly smooth; you're basically walking on rocks the whole time so it can take a lot out of you. But ohh, is it worth it! The white/grey shell of the plane matched the overcast sky and sat in stark contrast to the black sand beaches it rested upon. We somehow timed it perfectly and got there when there was a lull in tourists. Just the wreckage and us, with nothing on the horizon. The entire time we were there I couldn't reconcile that I was still in Iceland and hadn't just time warped to another planet. This one is a must see! Trust me, you won’t regret it. 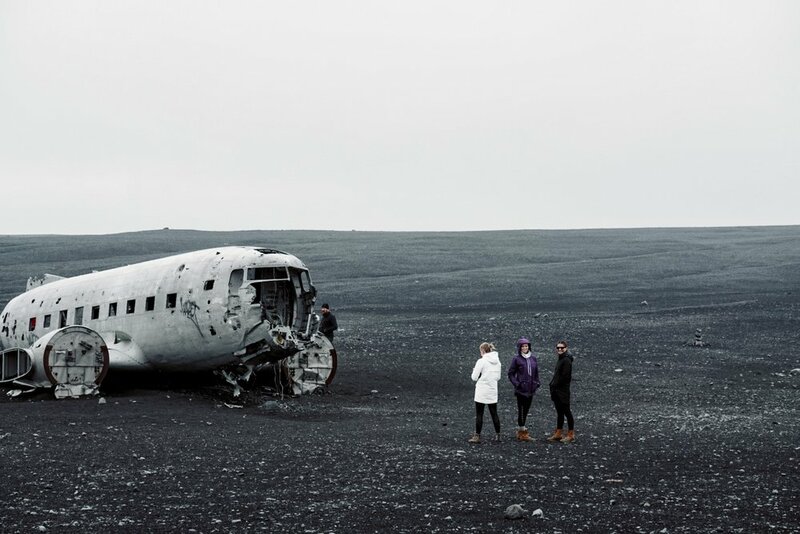 For directions on how to get to the Solheimasandur Airplane Wreck, click here.